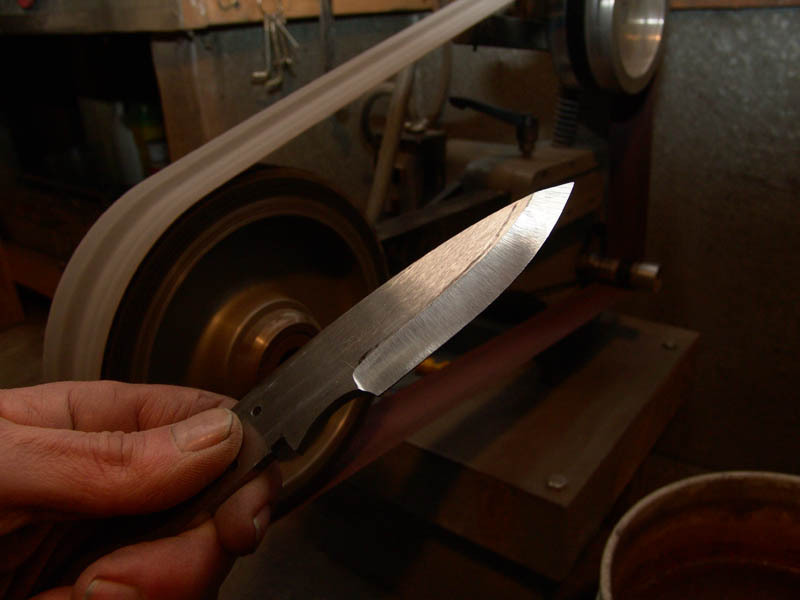 I am going to take you step-by-step through making a drop point hunting knife with a brass guard. You can do this yourself although you might use different tools than I do. 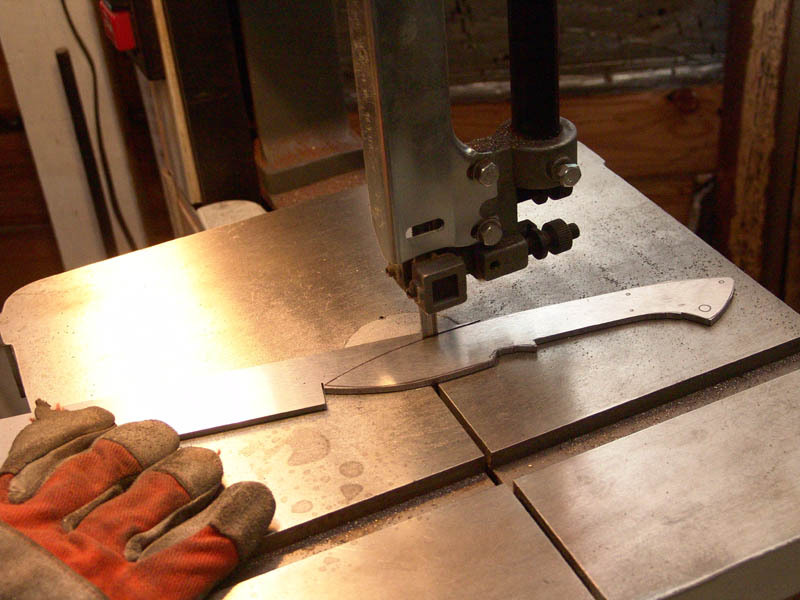 I am going to start with a bar of 1/8" thick CPM-154 stainless steel. I have drawn the shape of the knife with a Sharpie pen. 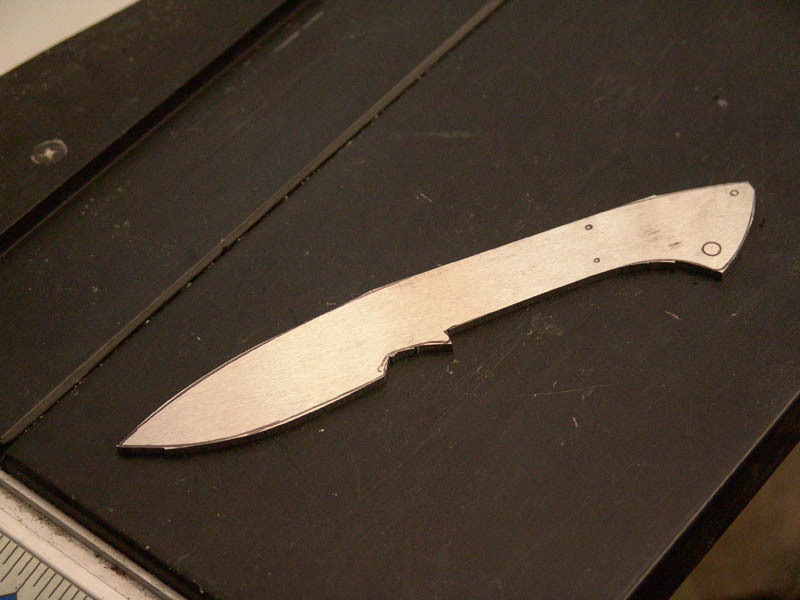 I am going to cut this out with a metal cutting bandsaw with a bi-metal blade. 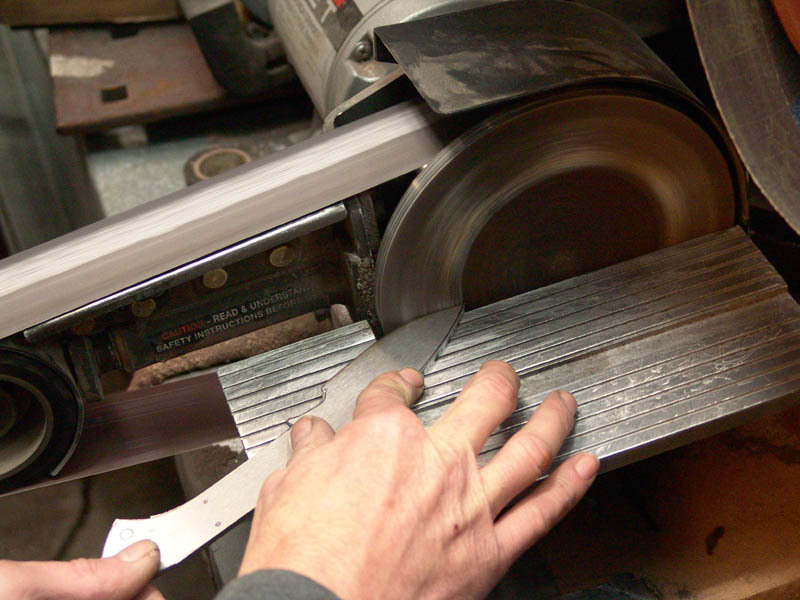 Note: Do not try to do this with a bandsaw designed to cut wood as they run much too fast for cutting steel. 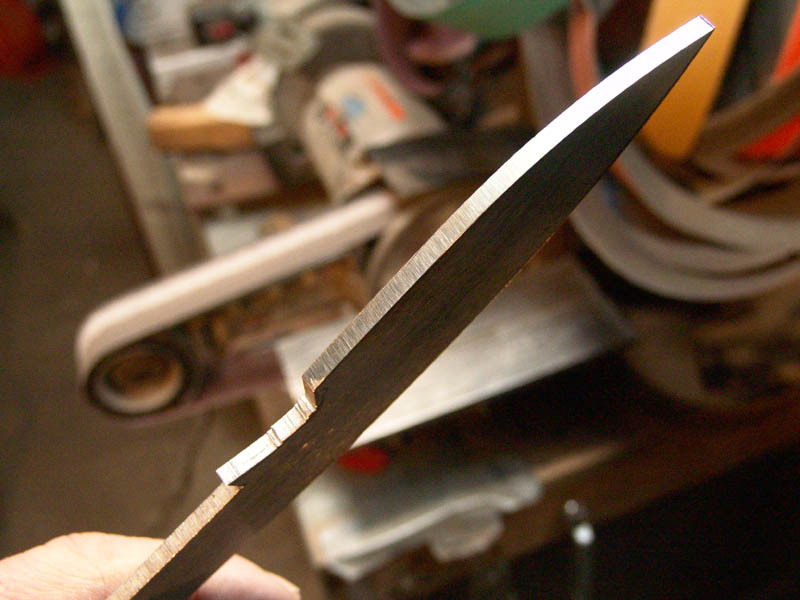 If you do not have access to a bandsaw, you can do this with a hacksaw. 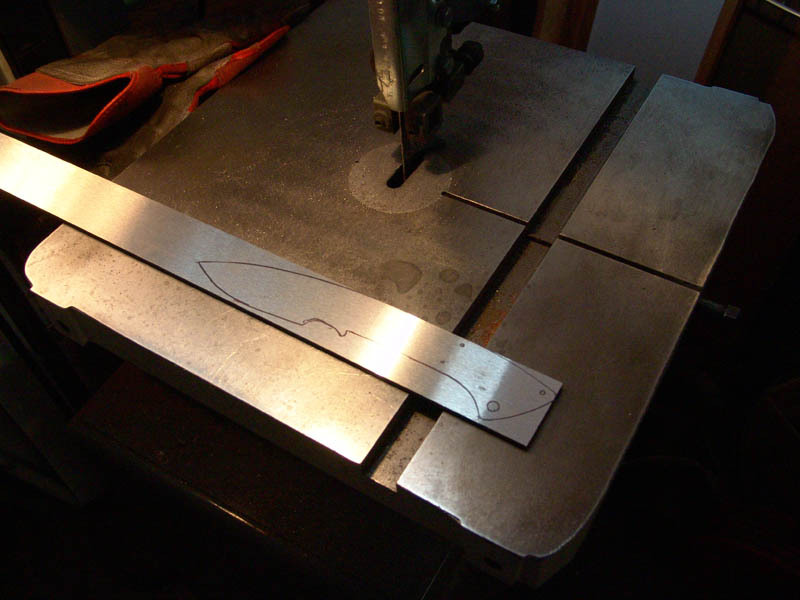 Here the blade is cut out pretty close to the lines I drew. 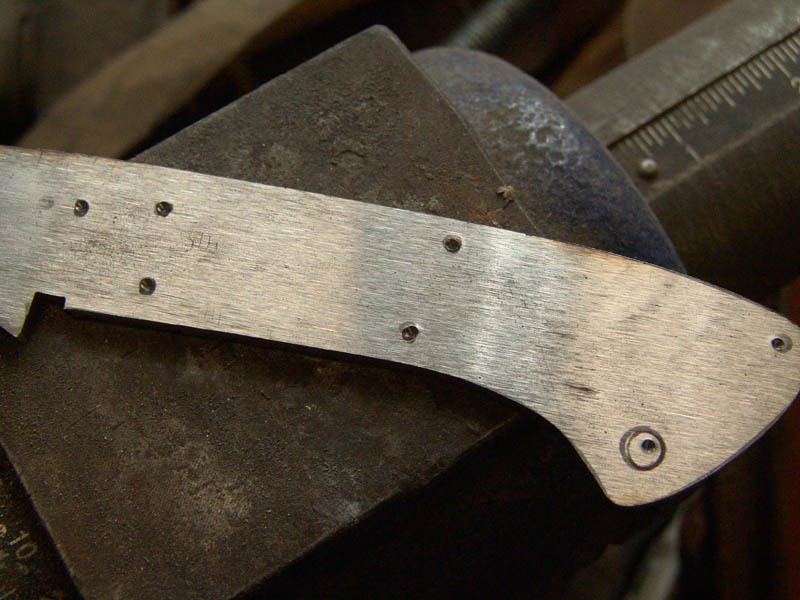 You can see that the edges are fairly rough from the bandsaw blade. 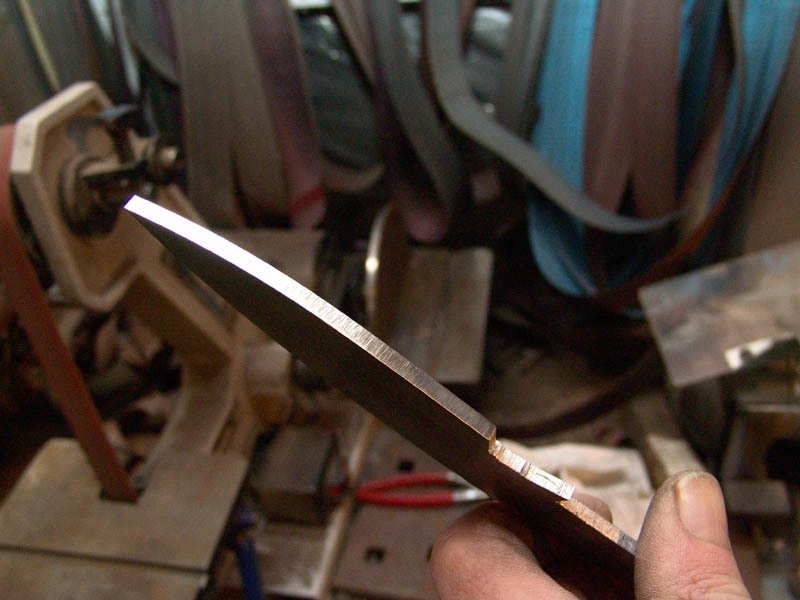 I clean up the edges and profile the shape using a disc grinder. This one has an 80 grit disc. You can see that it has cleaned up the edge pretty nicely. 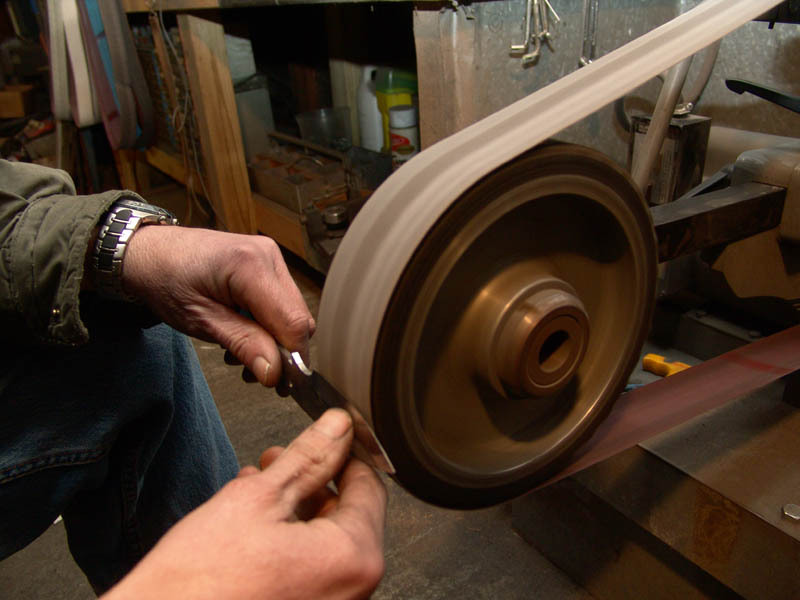 I happen to have a second disc grinder with a 120 grit disc so I take a quick pass on it to clean up the edges a little more. Now we are looking pretty good. 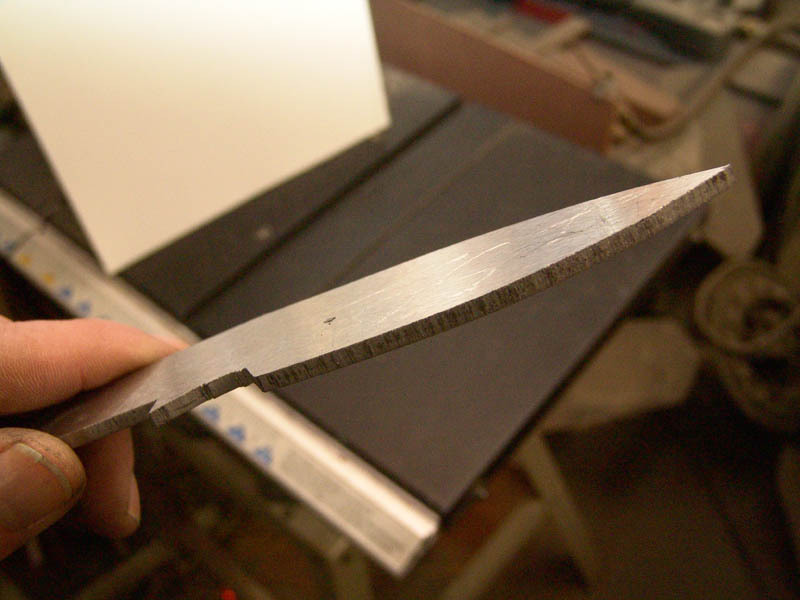 Good, clean edges will show our scribe lines better when we mark the center line on the blade as you will see in a minute. I clean up the tight areas with a Dremel tool and a sanding drum. 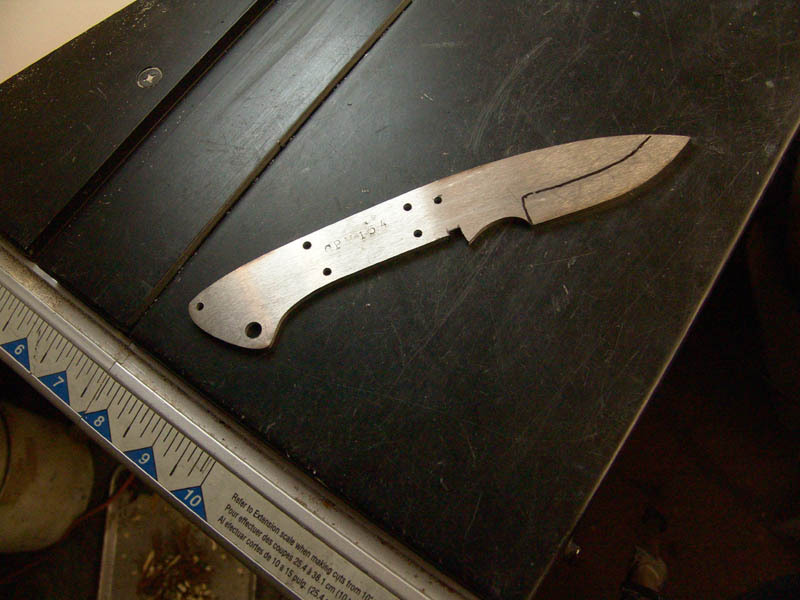 This knife will have a slotted brass guard so we need to make a 3/16" notch for the guard. I file the notch with a square file. 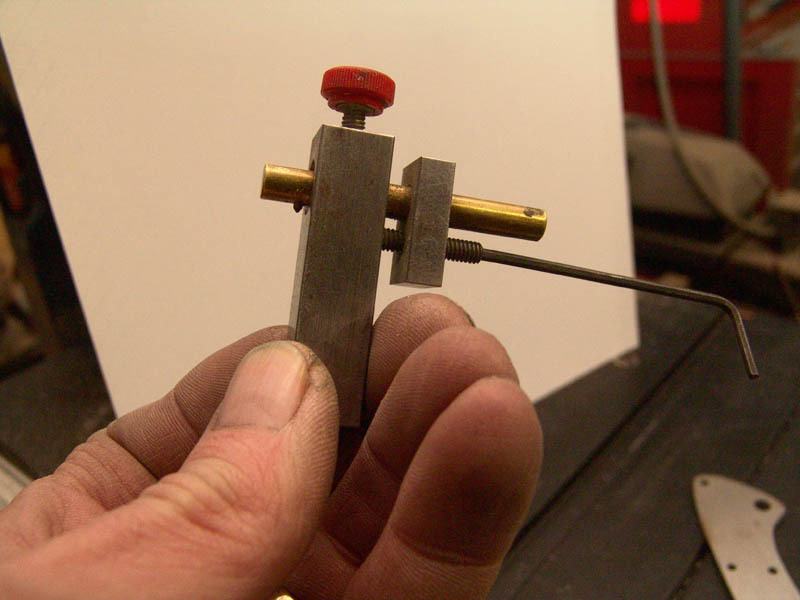 Now I center punch where my holes will be. We will have five 1/8" holes for handle pins, one 1/8" hole for a pin to hold the guard in place, and one 1/4" lanyard hole. 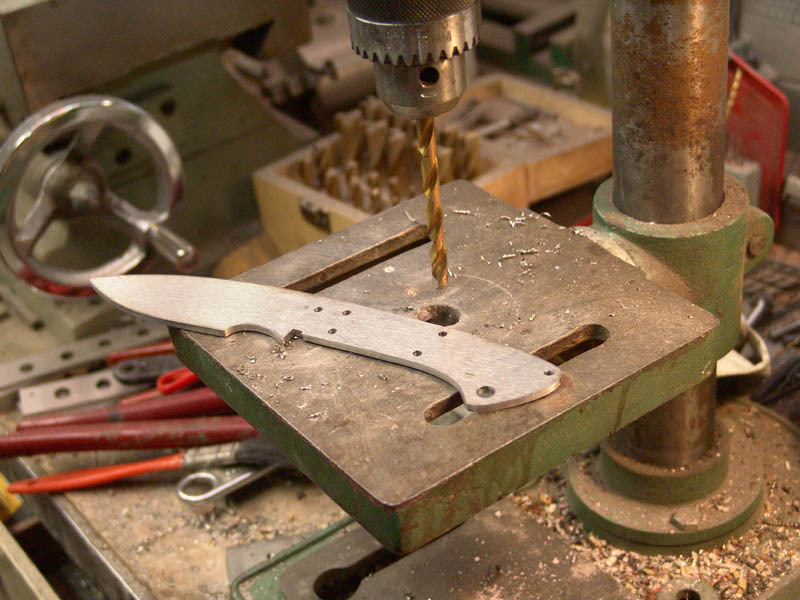 Center punching the holes makes it much easier to drill as it keeps the drill bit from wandering around on the steel. Drilling the holes can be a dangerous operation. 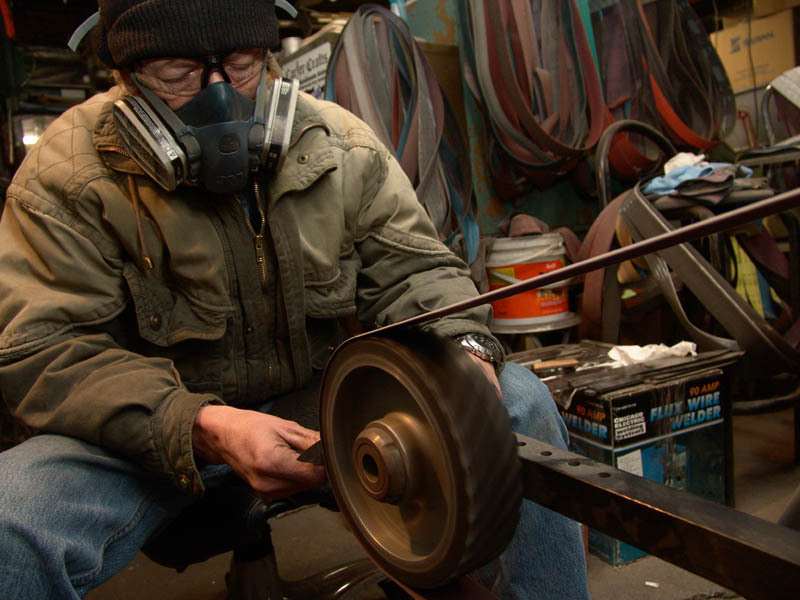 If the drill bit binds, it can spin the blade around very quickly and injure your hand. 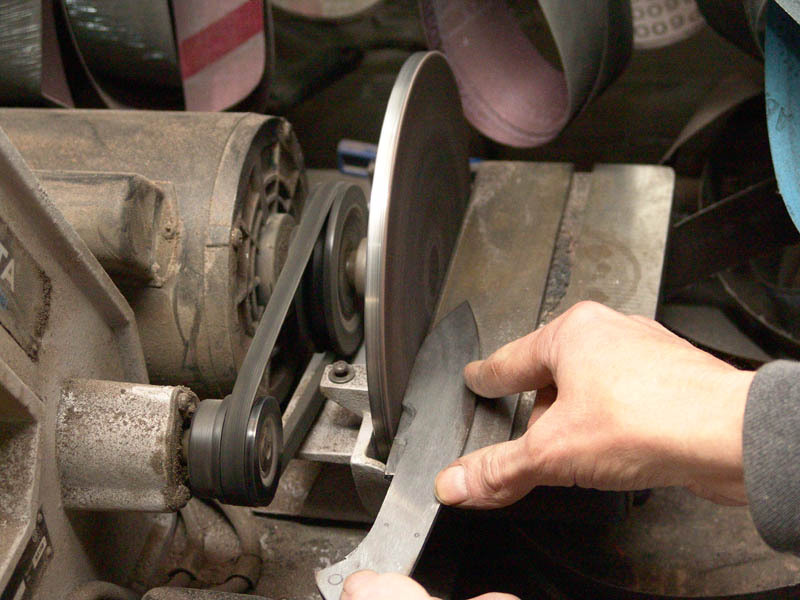 Be sure to have a firm grip on the blade and keep it pressed down onto the table to keep it from riding up the bit when it punches through. 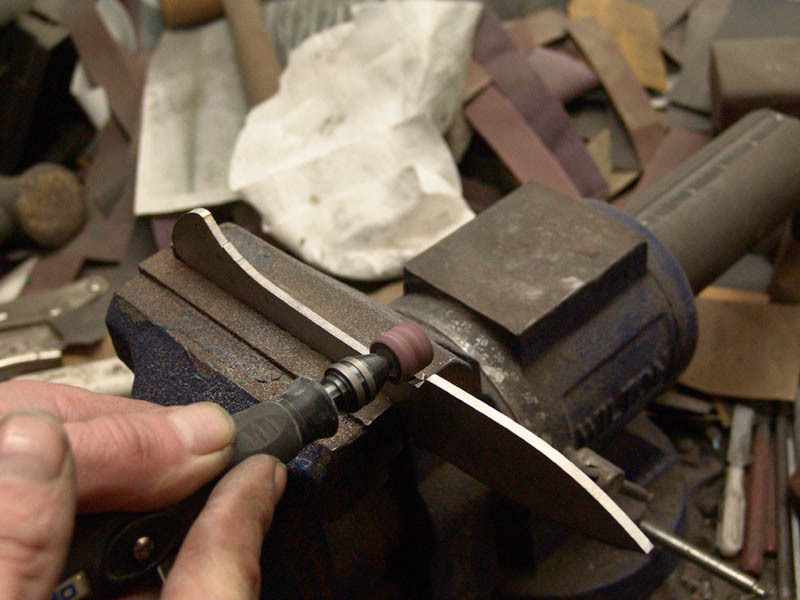 Better yet, you can actually clamp the blade to the table. 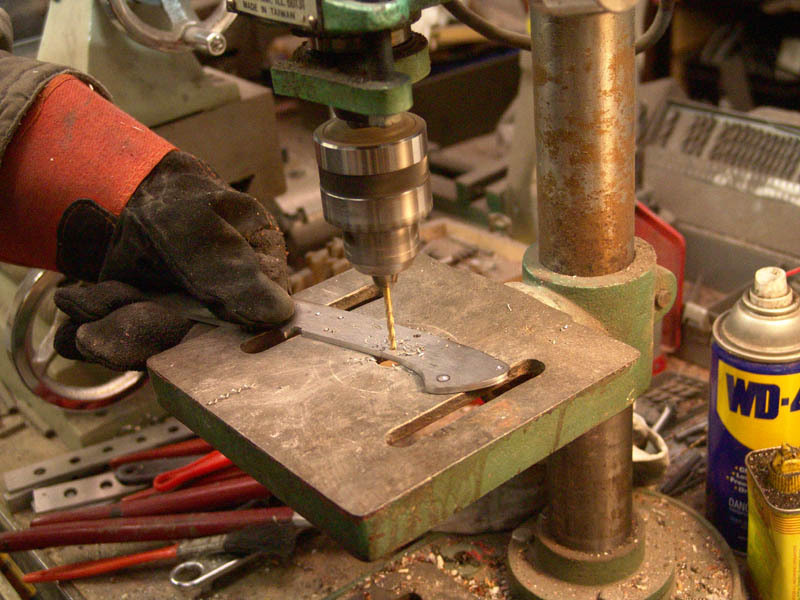 All of our holes are drilled. Now we need to mark the center line where our cutting edge will be. 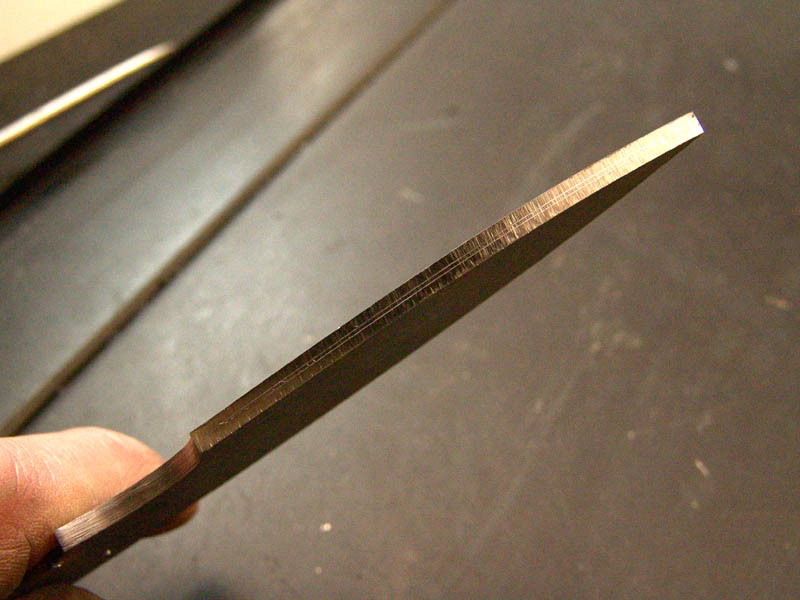 We are using 1/8" thick bar stock but it has been precision ground to a very fine and flat finish. This removed about 5/1000" to give us 0.120" thickness. 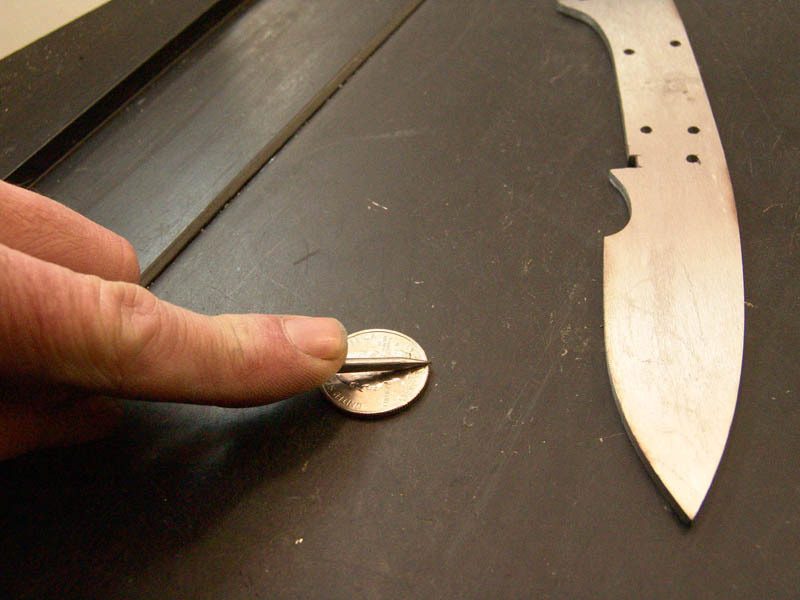 Since we want to mark the center of approximately 1/8 inch, we know that we need to make a line half of that, or 1/16" inch, from the side of the blade. There are a couple of ways to do this. 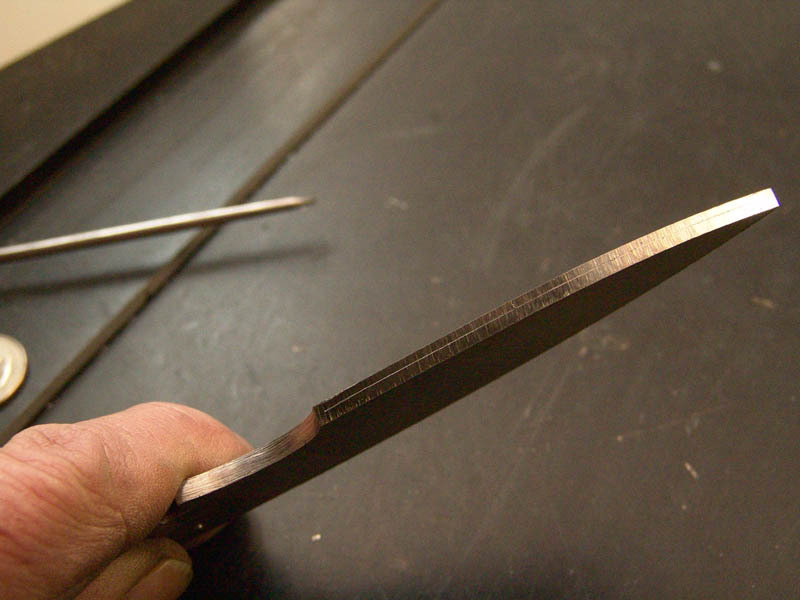 One way is using a tool specially make to scribe center lines. 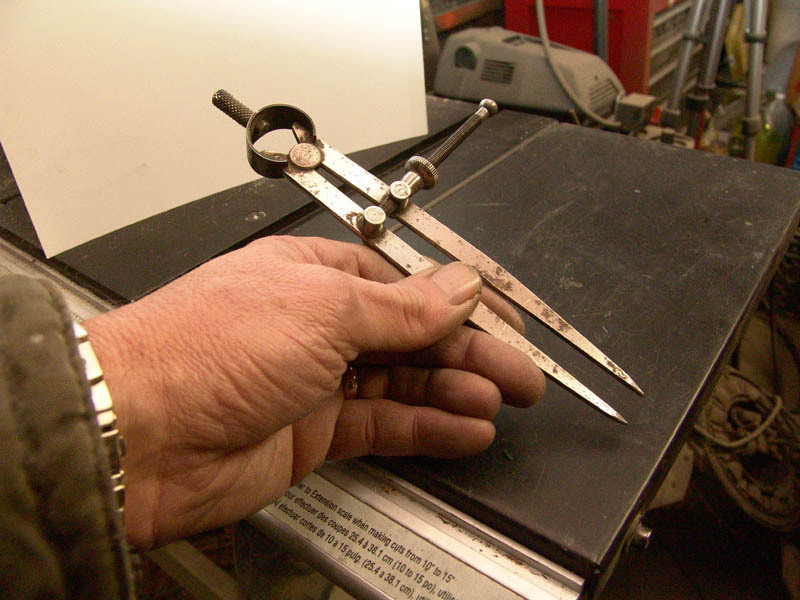 This tool is adjustable for various thicknesses and has a small carbide tip. 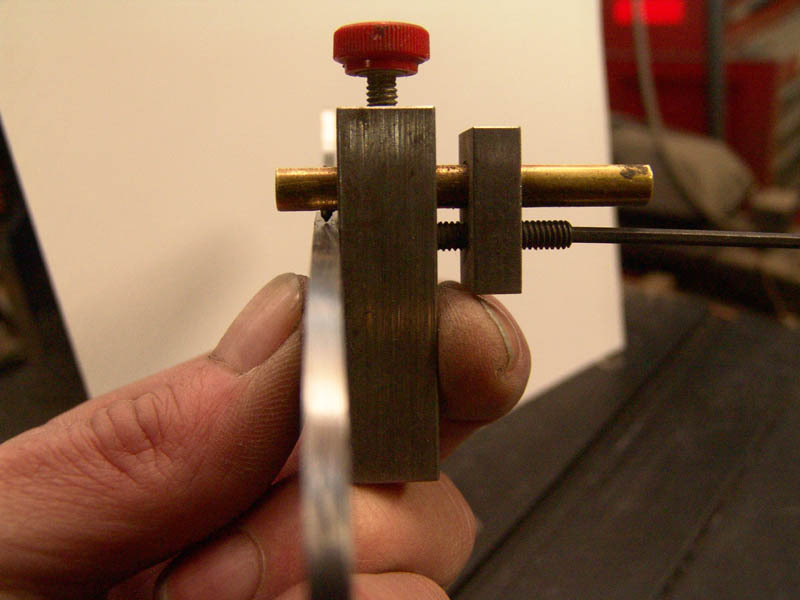 If you don't have a edge marking tool and you happen to be working with 1/8" thick steel, here is another way to mark your center line using tools you probably do have. 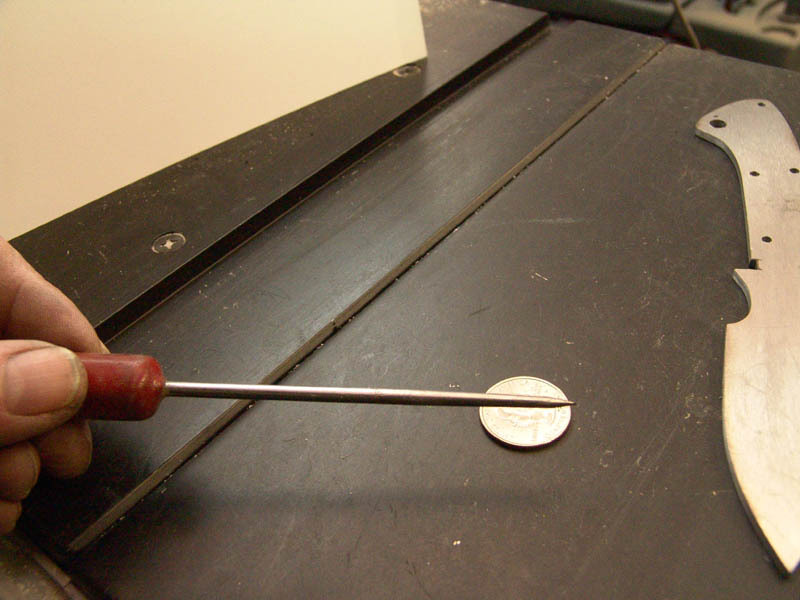 A U.S. Quarter is 1/16 inch thick, just the thickness we need to mark the center of 1/8 inch. 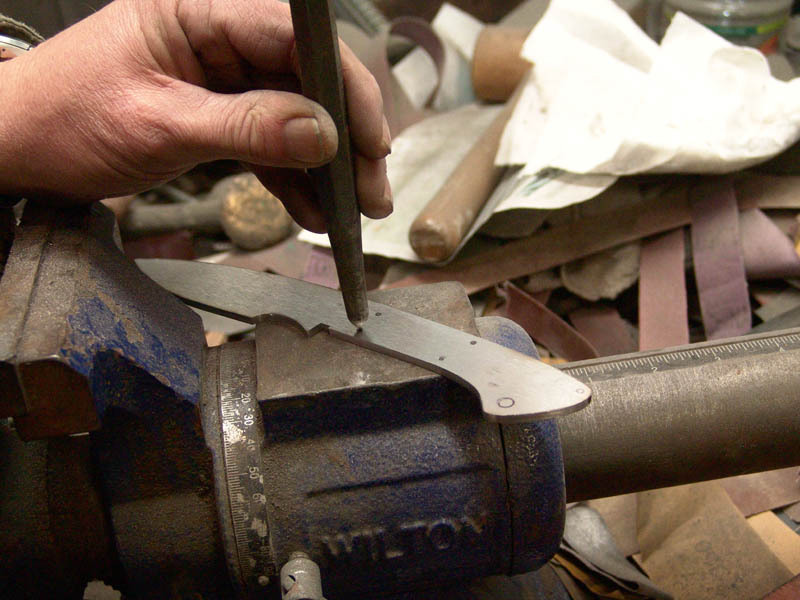 Find yourself an awl or anything that you can grind to a sharp point. 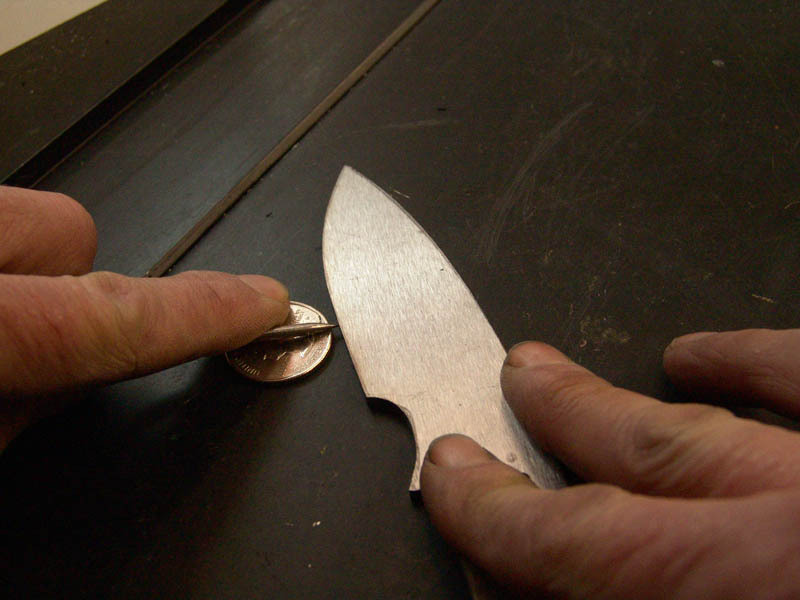 Lay the pointed tool on top of the quarter with the tip barely protruding past the edge of the quarter. 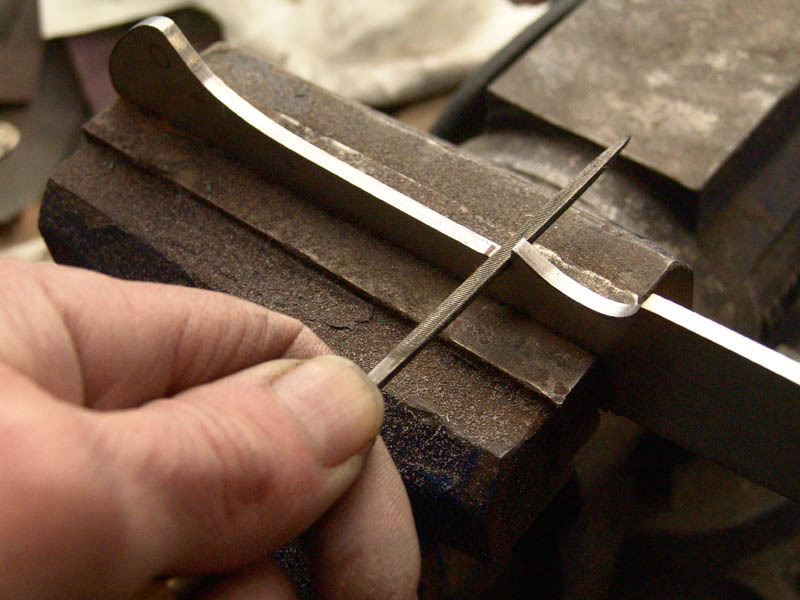 Now, while holding the point still, move the blade to the point and drag it past the point. This should give you a nice straight center line. 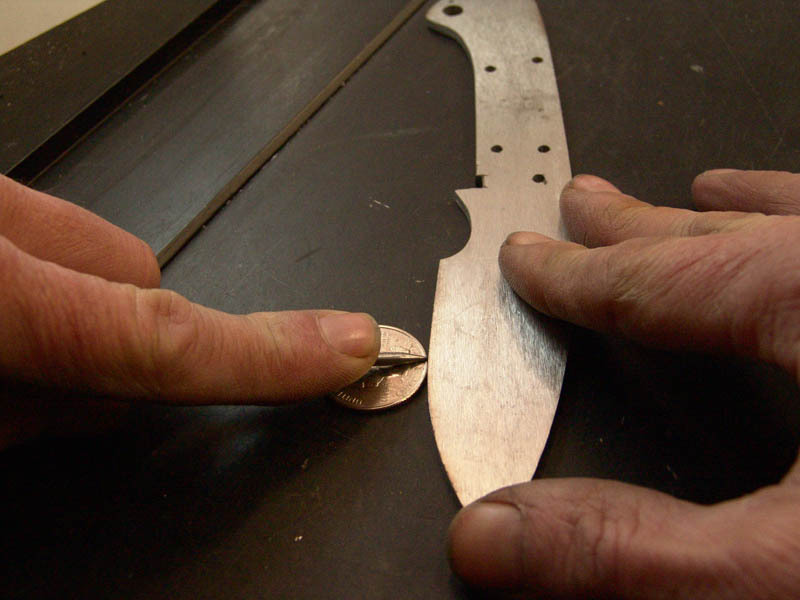 Just to be sure we are exactly centered, flip the blade over and do it again. If we were exactly centered you will have scribed the same line again. If we were off a little, you will have scribed a second line and your center will be between the two lines. You can see we have two distinct lines. 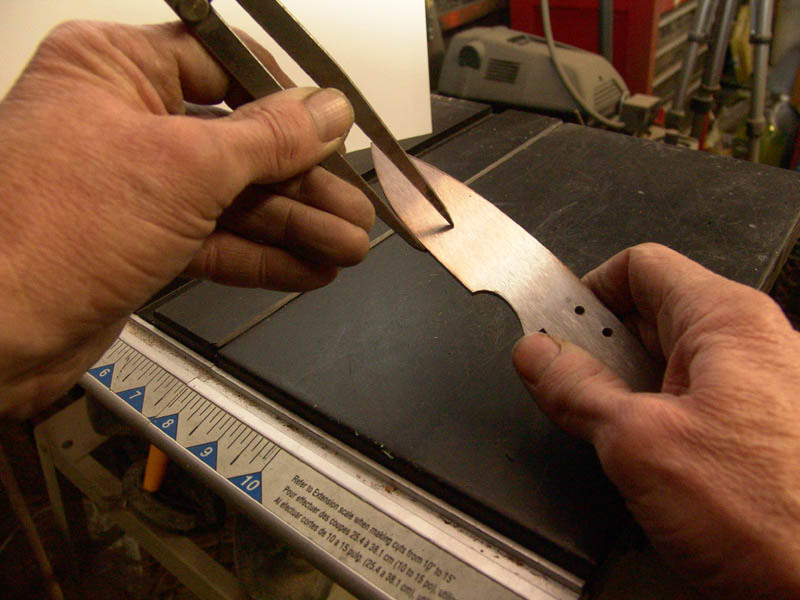 Some people actually prefer to do it this way as the thickness between the lines is about how thick I want to leave the edge before heat treating. 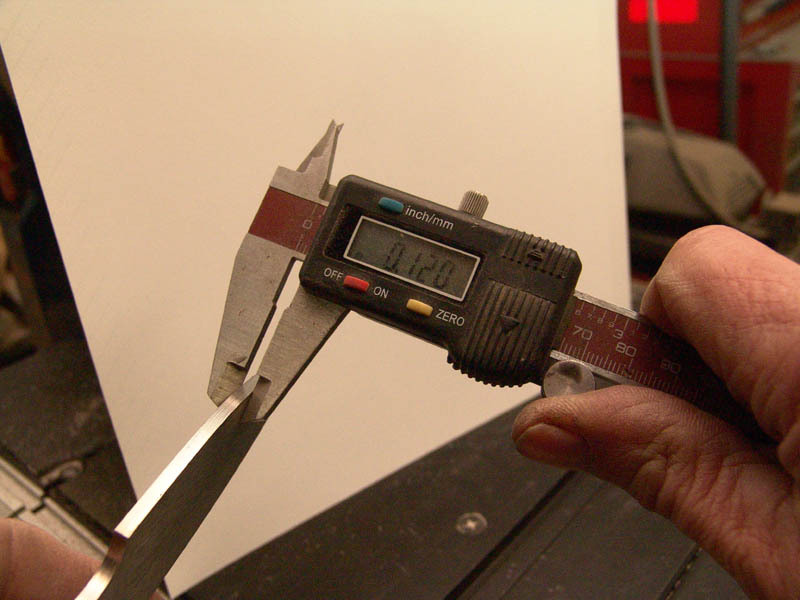 Getting the edge too thin raises the risk of warping during heat treatment. 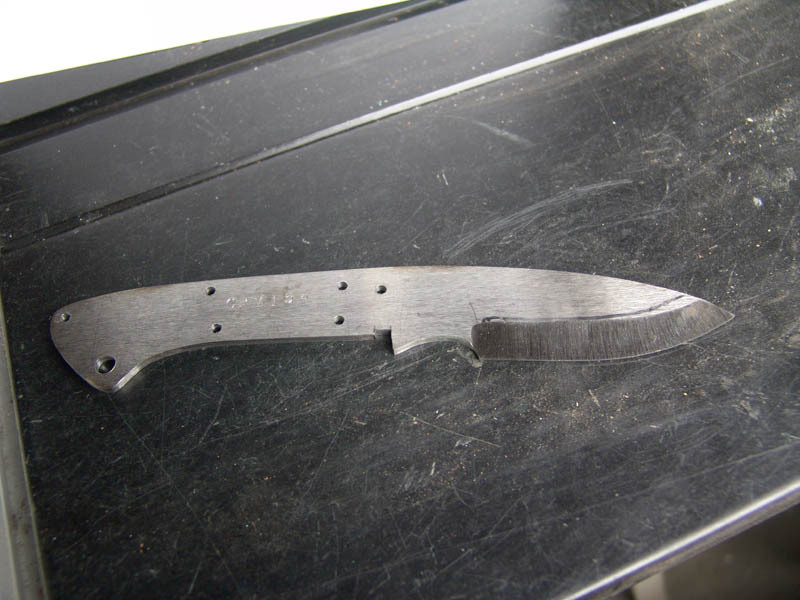 It is starting to look like a knife. Now we need to mark our grind lines. 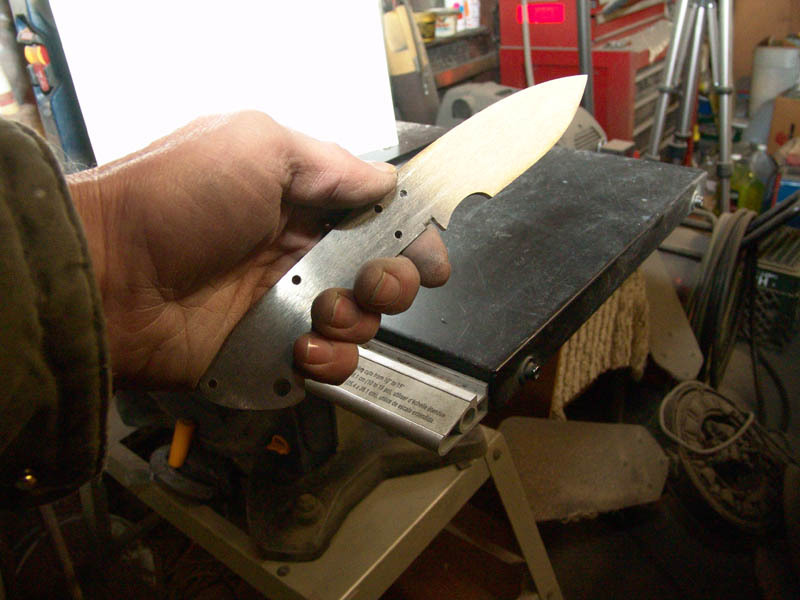 I plan to grind this about 1/2 inch up the blade. 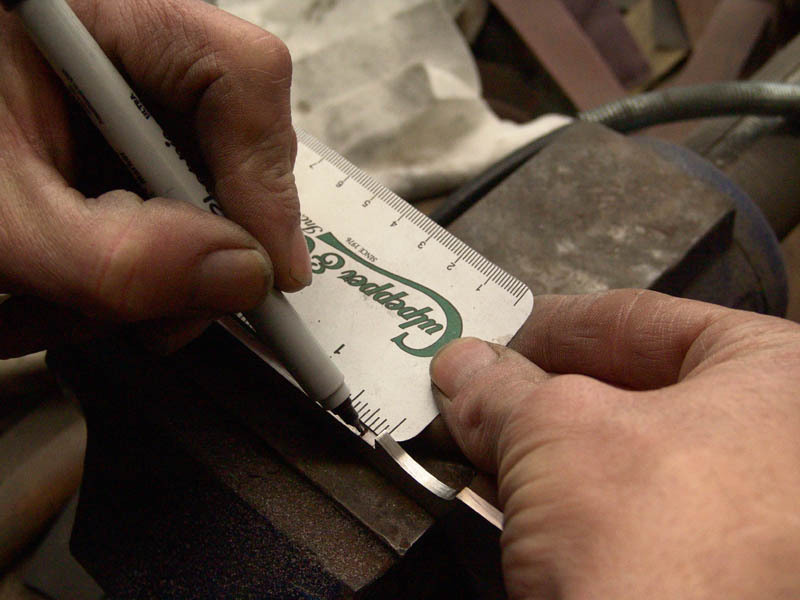 I use a set of calipers to help me mark the same height on each side of the blade. 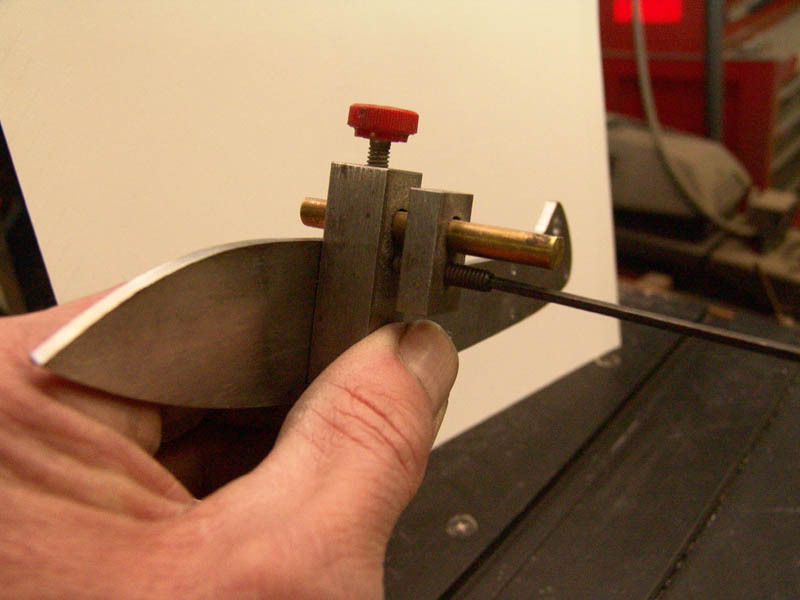 By following the edge of the blade with one arm of the caliper, I can scratch a faint line where my grind line will be. 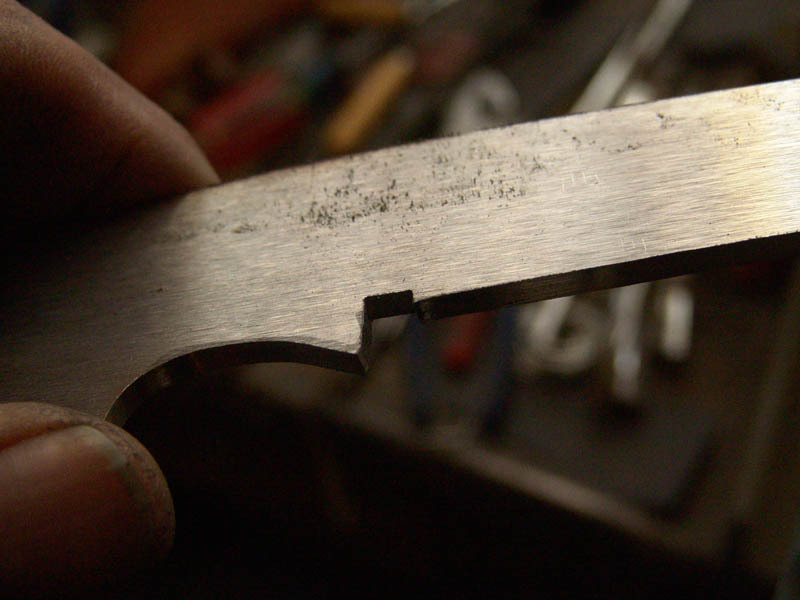 Do this on both sides of the blade. I go over the faint scratch with a Sharpie pen just to make it show up better. We are now ready to grind our blade. I am doing a hollow grind against an 8 inch wheel on this one. This is the rough grind. I started with 80 grit and finished at 220 grit. Now we are ready to heat treat. Afterward, I will grind it further with finer grits. Well folks, I kind of dropped the ball on this one. I started this tutorial quite a while ago and then got busy filling orders and never got back to it. 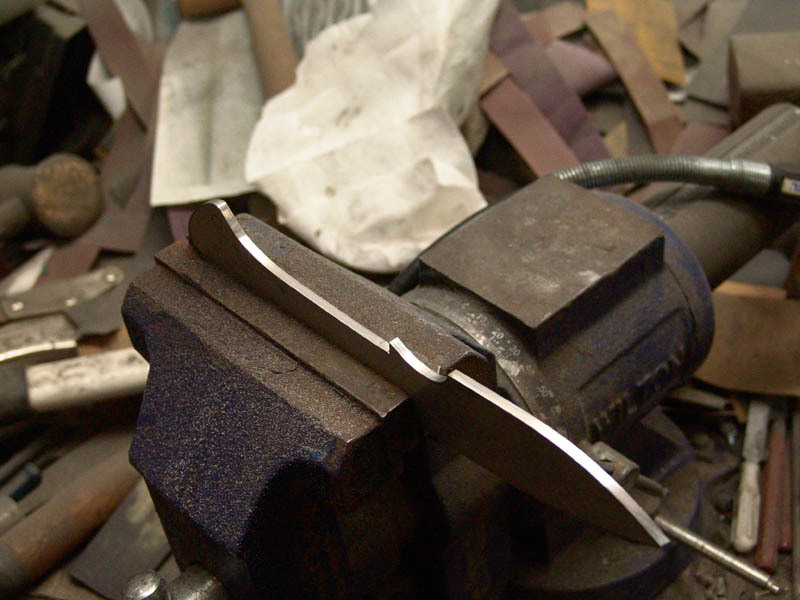 One day I decided that I had to clean up some of the half-finished knives cluttering up my bench. 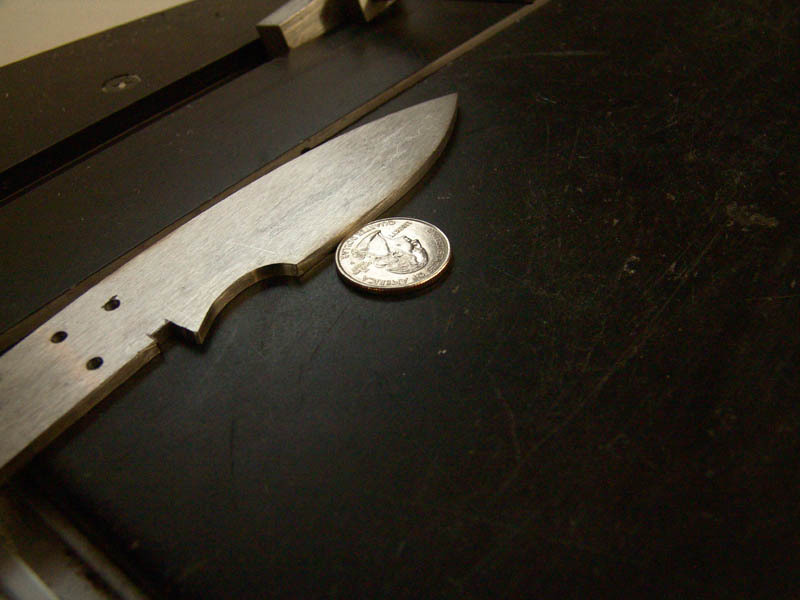 I grabbed this one and finished it before I realized that it was the blade I was using for the tutorial. I do apologize for leaving out a lot of the finishing steps. Someday when I can find the time, I will try again to make a complete start-to-finish tutorial. 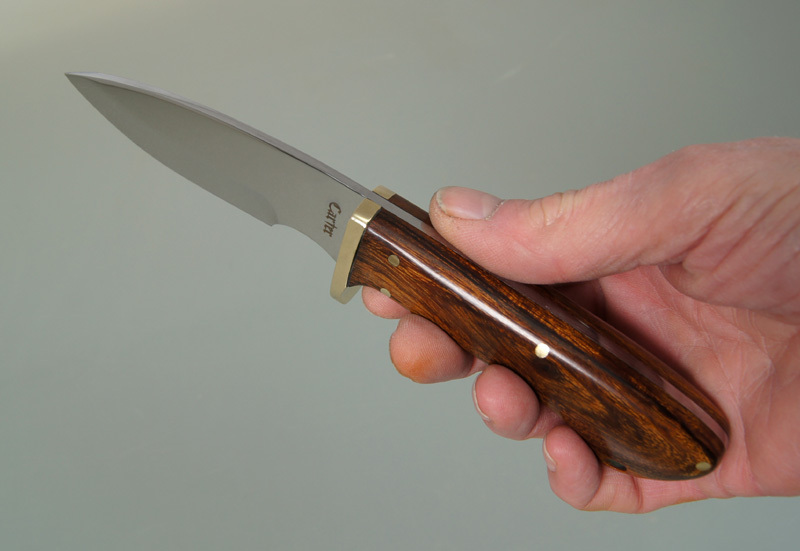 Anyway, here is the finished knife with cocobolo handles.